We have many music resource from internet, like music sites, online radio stations, or music search engines. 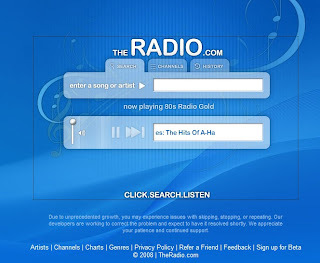 TheRadio is one of these kind of site, it is a music search site, and also is a music player. With a light blue interface that is so cool. It has two ways play music, one is use search function, just fill a song or artist name into a search bar. Another way is use Channel, pick a channel which you like, such as 50s, 60s, 70s... a lot of radio stations. If you want simple play music while you surf online, maybe it is a good for you.